The Dishwasher In a Vintage Kitchen, Who Knew?! The dishwasher, we take it pretty much for granted. When looking at a home, the dishwasher is a convenience that we have come to expect. We use it to store dirty dishes, and sometimes clean dishes as well. But how did the dishwasher come to be? It’s an interesting story. The first patent for a dishwasher was granted to Joel Houghton in 1850. It had a wooden paddle that splashed water onto the dishes, but it was fairly ineffective at actually cleaning them. L.A. Alexander picked up the concept again in 1865. In Alexander’s version, the dishes were spun through water on a rack. But again, the dishes were not effectively cleaned. The photo above is a great example of concealing a dishwasher drawer in a vintage kitchen. The four photos below show different drawer and door styles to conceal a dishwasher to blend in with other kitchen cabinets. The two photos below is a working vintage dishwasher. But in 1866 a woman, Josephine Cochrane, invented the first practical dishwasher. Josephine was quoted as saying “If nobody else is going to invent a dishwashing machine, I’ll do it myself” At the time, only hotels and restaurants were seriously interested in her dishwashing machine. It was considered expensive for residential use, and many people were comfortable doing dishes as they always had. Because this was a time before electricity was widely available, Josephine’s dishwasher was hand operated. She later founded a company that we know as Kitchenaid. In the 1920s, Kohler introduced the electric sink. The electric sink had a sink basin on one side and a dishwashing machine on the other. Although it was heavily marketed, not many were sold for residential use. The fact that most homes did not have sufficient supplies of hot water kept sales of the electric sink low. Also in the 1920s, William Livens introduced a front-loading dishwasher with dish racks and a rotating sprayer. This was more similar to the dishwasher we are now familiar with. However, this dishwasher was also not a commercial success for the same reasons. Hot water for residential use became more abundant in the 1940s. Dishwashers also gained the electric drying element in the 1940s. But only in the 1950s did dishwashers become inexpensive enough to be truly commercially viable in the residential market. Thus few kitchens prior to the 1940s had dishwashers. Since most people want dishwashers, I am often asked how they can be sensitively incorporated into a vintage kitchen that never had one. This question can appear more vexing because vintage cabinets are often shallower than what is standard today. 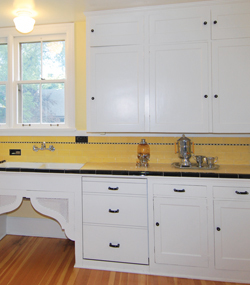 Many vintage kitchen cabinets have been lost simply because the contractor could not figure out how to put a modern-sized dishwasher into the shallower vintage cabinets. But there are ways to have both. Simply turning a two-by-four wall stud in the wall behind where the dishwasher will go can provide just the right amount of space needed. Pulling the old cabinetry forward can also be done, but doing that is more disruptive to the historic fabric. Yet another approach is to look for ADA (Americans with Disabilities Act) compliant dishwashers, as they are generally shallower than standard dishwashers. The key is to insist on what is referred to as “fully integrated” dishwashers. There are several brands that carry these types of dishwashers. These models can be fronted with custom cabinet panels made to blend with kitchen designs. When closed, they seem to disappear, and only the home-owner will know their dishwasher’s secret location. Some examples of brands that carry fully integrated models are: Asko, Bosch, Fisher & Paykel, Jenn-Air, and Miele. Fortunately for us, we can enjoy modern dishwasher technology that has been evolving since the 1850s. We can have state-of-the-art dishwashers that bring us convenience and efficiency, with dishwashers that don’t stick out like a sore thumb in period kitchens. Karla Pearlstein is a preservation consultant and provides educational resources and consulting services on the preservation and restoration of historic buildings. 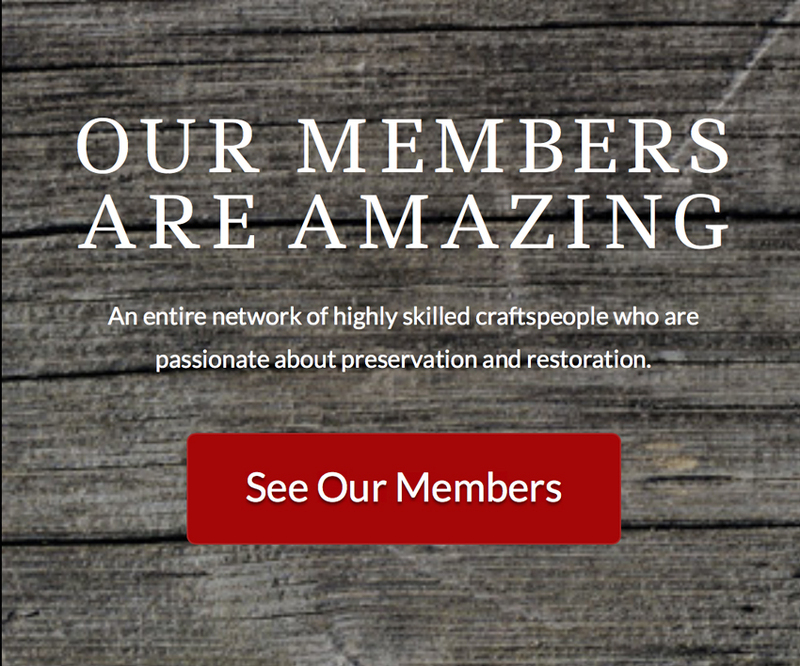 Contact Pearlstein at 503-452-7772 or visit www.restoringhistory.com.